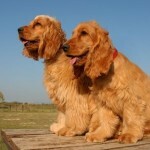 Cocker Spaniel are known for their loving and adorable nature. When trained and socialized correctly, they live up to their cute reputation. As ideal family pets, they’re great for homes with young children.